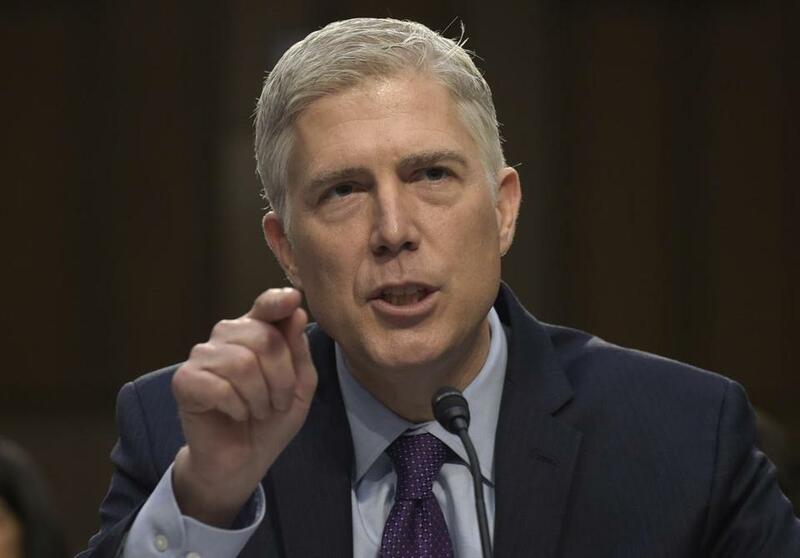 Supreme Court Justice nominee Neil Gorsuch testifies on Capitol Hill in Washington during his confirmation hearing before the Senate Judiciary Committee. Consider the frozen trucker. He was driving his tractor trailer when the trailer brakes froze. He pulled over and called the dispatcher. Nearly three hours later, after the heat in the truck cabin also failed, the trucker reported that he had lost sensation in his leg, and was having trouble breathing. The dispatcher gave him two options — to drag the trailer with the frozen brakes (which was why he pulled over to begin with) or to stay at peril to his life. He did neither, disconnected the rig, and left. When he learned that the repairman had arrived, he returned, reconnected the trailer and drove to his appointed destination. A week later he was fired. The Transportation Act protects truckers from retaliation for refusing to “operate” a defective motor vehicle. The trucker claimed a violation because he was fired for refusing to drag a rig with frozen brakes. An Administrative Law Judge from the Department of Labor, and then an Administrative Review Board, experts in this area of the law, ruled with him. The Tenth Circuit agreed; Judge Gorsuch dissented. Whether you agree with him or not in this case, the issue is how he got there and what it implies for future cases. The company agreed that the trailer brakes were defective and dangerous to drag it behind the truck’s cab. It agreed that the employee was at risk if he stayed. Their argument was hyper technical: Since he drove off without the trailer he had not refused to “operate” the vehicle. The act doesn’t precisely define “operate.” Health and safety statutes rarely do. No legislature can predict all of the contingencies following enactment. In a democracy, Congress often uses broad terms — the anti-discrimination laws, for example — because legislation is the product of political compromises. And if Congress hasn’t directly addressed the precise question, courts are not supposed to invent their own. Expert agencies fill the gap. But Gorsuch rejects all that. He does not believe in deference to administrative agencies. He hinted darkly that the “administrative state” poses a grave threat to democracy. And he even rejects the usual standards for legislative interpretation, which calls for interpreting language in the light of Congress’ purposes. It is a mistake, he says, to “assume a statute pursues its putative purposes to their absolute and seemingly logical ends,” singling out health and safety statutes for special ire. But Judge Gorsuch’s next step is even more cynical. If Congress disagrees, Judge Gorsuch says, they can fix it, knowing that will not happen. It can never legislate in detail, never account for all contingencies. It would be one thing if this approach were idiosyncratic but for Judge Gorsuch, it is not. He ruled against an autistic child, who claimed a violation of the statutory right to a “free appropriate public education.” In doing so, he rejected the expertise of school officials and substituted his own crabbed view. The Supreme Court reversed, 8-0. Or take the case of the Kansas State professor who requested a leave of absence to recover from a bone marrow transplant. When her doctor advised her not to return because of a flu outbreak on campus, she sought further leave, beyond the six months she had already received. Judge Gorsuch ruled that an extension of the leave was not a” reasonable accommodation” — applying his own restrictive interpretation, rejecting agency guidance not to mention case law in other districts, including our own. If this approach were accepted by other justices it could gut major health and safety and anti-discrimination legislation. Worse, Judge Gorsuch would be doing this with the false patina of neutrality, claiming it was based on a restrictive view of judging rather than precisely the opposite.